This is my previous char siew filling recipe. It involved cooking the char siew in whole pieces, dice and cook them a 2nd time with the gooey gravy. I was thinking... it seems stupid to make proper char siew, dice them and then prepare the filling. Is there any other way that the restaurants are doing it? Any express way? I keep on thinking and thinking... and then.. I thought, if I dice it right after it's solid enough (after cooking) and then cook it in the same gravy, it'll still be the same, and the cooking time will be much shorter. There's really no need to cook it in big slices and then... dice them. Let's just hit the 2nd part of the cooking straightaway. 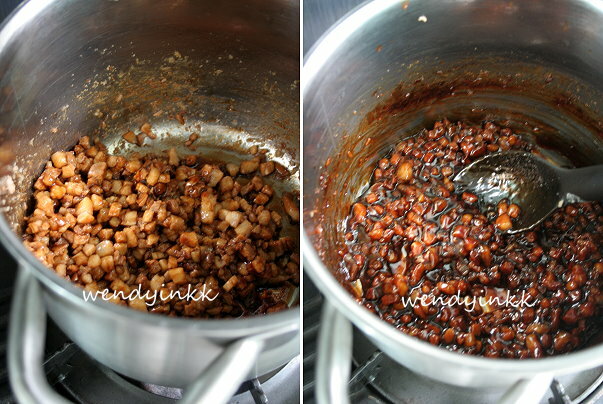 Here's my new found express way to make delicious char siew filling for my husband's favourite buns. 1. 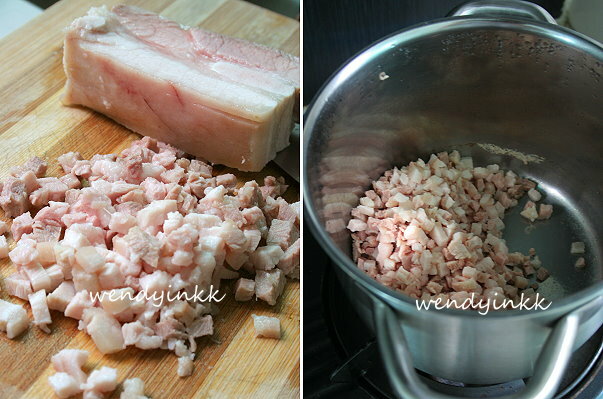 Boil pork belly in 2 cups of water for 15 minutes or until cooked. 2. Fish out pork belly and let it cool down until it is manageable. 3. Retain 1 cup of the pork boiling water, cool and mix with cornstarch. Set aside. 4. Finely dice pork belly. 6. Put in soy sauces, wine and oyster sauce. Cook until the pork looks dry. 7. Put in sugar and cook until it melts. 8. Put in cornstarch mixture and cook until the gravy thickens. 9. Put fillings into a bowl. Let it sit for 15 minutes and you will see some oil on the surface. Use paper towel corners to absorb the oil, if preferred. 10. Chill filling or freeze until time of use, remember to cover it to prevent drying out. Oh, this is just great! Home made char siew from the scratch!! I loves CSP filling a little wet sauce in it instead of dried. It sure looks real yummy and delicious! TQ so much. haha, the filling looks easy to make but i really lazy to make the dough....sigh....must find some motivation. 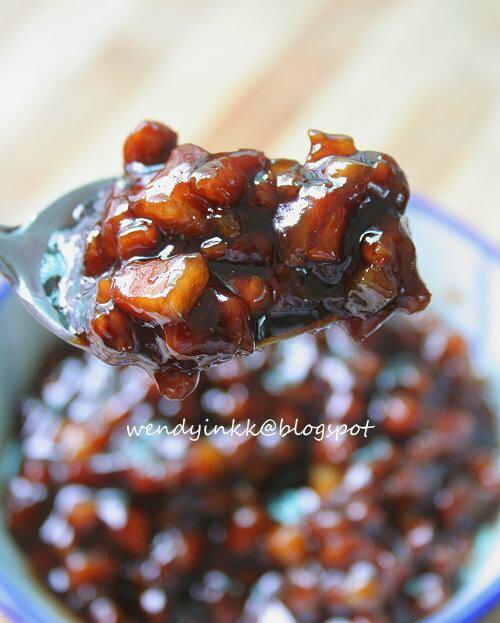 Thanks for sharing this quick and easy char siew filling..recently i found out that we don't really like Chinese rose wine taste after i first attempted making char siew.. The dough is actually not that hard. It's not the same as making bread dough, much easier. Rose wine gives lap cheong and pork jerky that distinctive smell. If you like commercial lap cheong, I wonder why you don't like rose wine. I love the second photo, make me feel like eating the char siew fillings right away. If u can read Chinese just to share the below link with u, I always follow this easy method of preparing the char siew filings. Thanks. I tried to read, LOL. Definitely like your version of char siew filling . 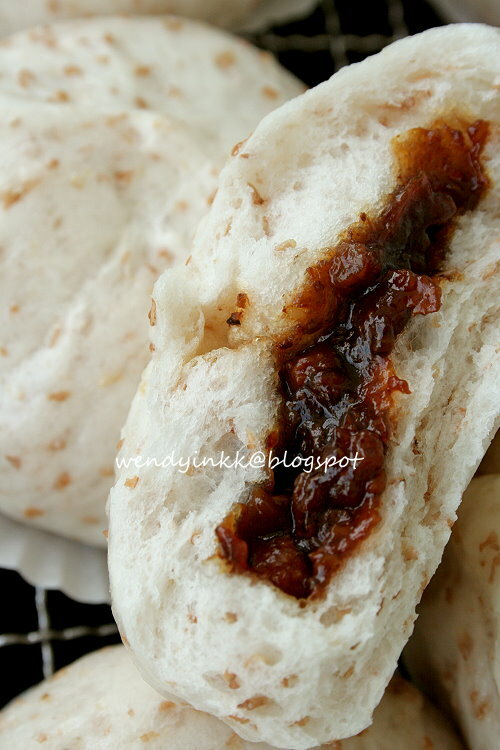 Feel like making char siew pau now! Anywhere where do you buy the rose wine? Chinese medicine store? I can't find in the normal grocery shops. Dear Wendy, I've been diligently reading all your recipes and most of them just makes me drool. I miss food from home! (Singaporean by the way) I'm living in Shanghai at the moment and i need a VPN to access your blog. Anyways, just to pop by and say Hi! Love your blog! Ok, project char siew pau is in the works. Where to buy rose wine, ah? It's called 玫瑰露 in Chinese and available in liquor stores. Kedai Arak operated by Cinapeks, hahahah. What if I tell you, it's Kam Ling's buns are better than YFM, that's my own personal opinion. The only reason I'll order CSP at YFM is just to ease the craving, and that's not my craving. Sik ju sin only, ting har yaen. This is brilliant! 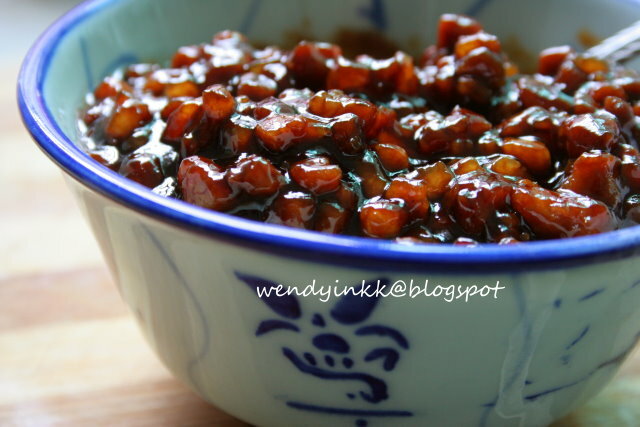 Now I can make super easy char siu filling! The hard part is the bread dough :( I nv heard of rose wine until now. Most char siu recipes I see call for hoisin sauce, but I'm glad yours is very pure and natural just using soy sauce and sugar. How does the taste of that compare? Also, why do you remove skin? Rose wine gives sweet meats that distinctive smell, in sausages, and jerky. Hoisin sauce taste weird to me in char siew, maybe I didn't grow up eating char siew made with that. love love love this.. will make this once!! I followed ur cha siew filling recipe and it is in the fridge now. hope to be able to make it tomorrow. I like it gooey too.=) will tag u on FB once i made them. =) thanks for your recipe. Oh, I dunno Kam Long bakery has paus. Kam Ling restaurant sometimes put coriander too, not always. But I think lately they don't cos it makes the filling less lasting. I mean kam ling instead of kam long. (blame my iphone for the typo :) ). Hi Wendy. Do u think I can use soft lean mean to make this filling? TQ. Then must add oil to the 2nd part of cooking. At least 3 Tbsp to get a good effect of sheen and flavour. Hi Wendy. Sori question again. Any substitute for rose wine? Cant find wor. My place dont have cina apek liquor shop. Any type of chinese wine then, but the smell will be different. Hi Wendy. I found the rose wine at chinese medical hall at last. Made this plain CSP with 100% lean meat yesterday. I am too greedy putting too much filling (44g dough:32g filling) till some paus leak, some paus laughing (top open) and some paus can see the colour of the filling cos the skin is too thin. Guess must improve of my rolling and wrapping techniques. The filling is very fragrant and tasty and you are rite it will turn salty after steaming. Maybe if my pau skin thicker the taste will be ok or should I reduce the amount of light soya sauce? Anyway mu hubby who never eat CSP outside (because he dont like the fat pork)ate 3 in 1 go. Haha... Thanx so much Wendy for this easy recipe. Will definitely make this again. Diff brands will have diff saltiness. But then again, if you used more filling, it will be more salty on the overall. Homemade ones, even if use belly won't be as fat as those sold, but the meat is far more tender than lean meat. Ya Wendy. You are rite. Lean meat is abit not so soft. But hubby and I prefer it to be fats free. Anyway I will try to make once using pork belly to taste the difference. Off cos with 50:30 dough and filling ratio. By the way can I omit the wine totally? Hubby is a bit sceptical about giving this pau to my 3 year old daughter cos he said it contains alcohol wor (Rose wine is 40+% alcohol). Thanx so much again for sharing. I can now make my own CSP!! Yeay! 20ml of this divided by the amount of buns you make, you can calculate the potency. It's not the same like drinking the alcohol raw. 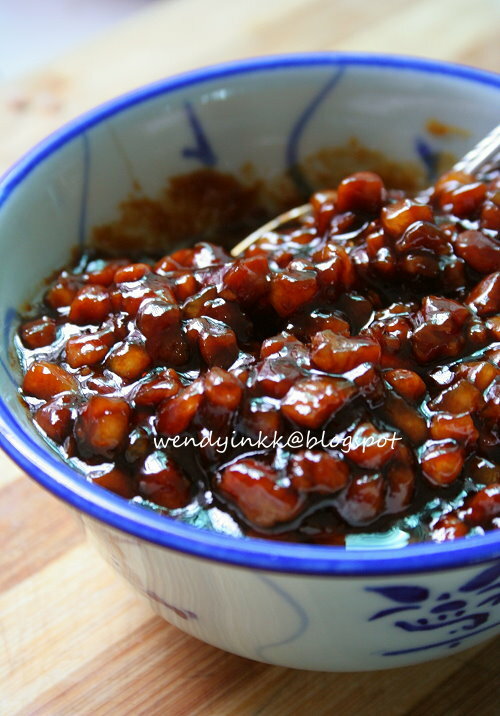 It is also found in lap cheong or yoke gon. But then again, it's up to you to use or omit. How much gravy left, the brand of soy sauce used makes a difference. Not all soy sauces taste the same. But then again, it's personal preference, use less if you like. I love your web site!!! thank you for sharing your recipes with us. I over cooked the pork belly in Step 5 so the meat is very hard in the end. I must cook it less time in next attempt!!! Im looking forward to your new recipes!!! A good piece of belly shouldn't be hard due to the marbling of the fats, even if you were to cook it longer. Other parts could turn hard. It is a easy recipe to follow but the meat is a bit tough when cook like this for the buns. which cut of meat did you use? Hi Wendy, tried your recipe and I made it into baked siew pau, turned out pretty good!! true recipe keeper. Thanks so much for sharing. Hi Wendy, thanks for sharing this great recipe. Looks really yummy! Need to know if I need to fully cook the pork on the first stage? Is it on low heat? Possible to replace with lean pork instead? If yes, any change to the method? yes, there will be changes to the method. refer to comments dated 22 Sept 2012. You can choose leaner pork belly, as not all are fatty. But if you use lean pork, take note that final results will be drier and tougher, even with the added oil. Needs not be very thoroughly cooked during boiling, as long as it can be cut into cubes , it is good enough. Please keep uneaten buns in the fridge, and reheat by steaming before eating. Using other cuts of meat might make the pork filling tougher.